JESUS IS ALIVEHosanna MusicRon Kenoly leads a congregation of 2,400 in singing You Are The HolyOne, Be Glorified, Holy Lord, Rock Of Ages, and more. From Word. Dr. Ron Kenoly travels world-wide creating an environment for God's presence. He is known for his praise & worship music around the globe. His music has become best-sellers in both the church and contemporary Christian markets. 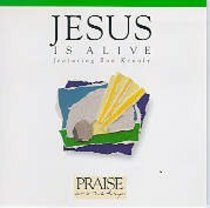 Among his popular music releases are included: Jesus Is Alive, the gold-selling Lift Him Up, God Is Able, Sing Out With One Voice and Dove Award-winning Welcome Home. Dr. Kenoly has stepped into a new season of ministry where his heart and vision are to mentor worship leaders, pastors and worshipers.